The first door on the Bishops’ online Advent calendar was opened on Sunday. The Irish Bishops’ Conference online advent calendar went live yesterday, on the first day of our preparation for Christmas Day and the Feast of the Nativity of Our Lord and Saviour. The online resource was launched on Friday by Archbishop Eamon Martin of Armagh. This is the fifth year that the Irish Hierarchy has an interactive calendar as a feature of their website. They claim the resource is unique in Ireland, and they recommend its use in parishes, schools and in homes. Other features include suggested family prayers; Advent videos on subjects such as blessing of the crib at home, blessing of the advent wreath at home, etc; words of Pope Francis from WMoF2018; suggestions on how to make Christmas more sustainable, so as to care for our common home; Advent music and seasonal prayers; a calendar of Advent events in dioceses and parishes; and information on Trócaire’s Global Gifts campaign. Launching the resource, Archbishop Martin said that, as well as being a time of spiritual preparation for Christmas, Advent was also a time of preparation for the Parousia or the second coming of Christ, as promised in the Book of Zechariah and the Book of Revelation. 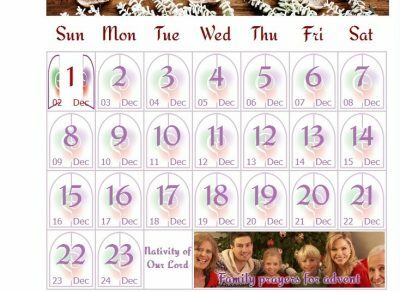 “I invite everyone during this season of Advent to enjoy our online calendar which highlights themes of love in the family as well as mercy and peace. Thank you to all who contributed to this year’s content,” Archbishop Martin said.